I grew up on a dairy farm in South-Western Quebec and have always been interested in animals. I received my BSc. in Agriculture from MacDonald College of McGill University, specializing in Animal Science. Animal Breeding and genetics have always been of special interest. After graduation I worked for the Ontario Dept. of Agriculture, Extension Branch, for several years, and then switched to the food industry. For over 50 years I worked in Quality Assurance, Production, Product development and Food Technology. I am now retired. I had Pekingese and did limited breeding and showing in the 60's, then switched to Dachshunds in the mid 70's. I have been active in mainly Standard Smooth Dachshunds ever since. In 2003 Siberian Huskies entered my life and I now also co-own and co-breed some with partner Eric Schweichler (TrailRoc). My main interest in dogs is the breeding of sound animals with good type and temperament. Emphasis has always been on the breeding females, although I have retained some males that have shown and produced well. I soon discovered that winning meant nothing to me if I wasn't showing the dogs myself. For this reason I have always handled my own dogs and have never campaigned a dog. I enjoy dog shows and the many friends I have made through them. In 1995 I obtained my first CKC judging permit, and have enjoyed the experience ever since. I am now approved to judge All Breeds. 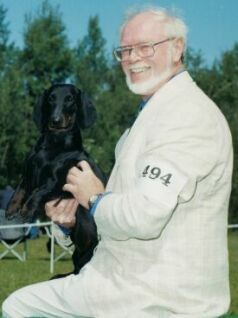 A Founding Member and Past President of the Eastern Canada Dachshund Club (ECDC) and Secretary of the St. Lawrence Region Dog Judges' Associaion, I have been President of the Hochelaga All Breed Club (HKC, Montreal) 3 times. A Life member of the Canadian Kennel Club, ECDC, HKC, and Chateauguay Valley Kennel Club, I also belong to Dachshund Club of America, Siberian Husky Club of Canada, Canadian Dog Judge's Association and American Dog Show Judges Inc.